I have started the countdown. Not for Christmas. But for the end of the semester. There is just three more meetings for my Monday and Wednesday class, three more meetings for my Tuesday and Thursday classes, and two more meetings for my Friday classes. I have two out of three papers passed so far, and one has returned to me for minor revisions. I have one homework assignment left for my Syntax 1 class, and I have taken the test for Historical Linguistics. I only have to take the final exam for Syntax on December 16. Tomorrow, I have an appointment with a fellow graduate student. She is recording my speech. 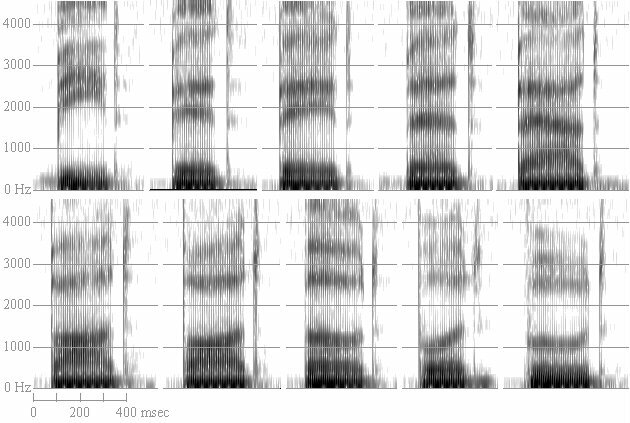 She needs to see the formants of the Tagalog speech sounds, and so she needs me to pronounce the words on a microphone connected to a computer and then a spectrogram will then be produced, similar to the picture here. Four main lines will show, and just by looking at the positions of the lines, one can tell what kind of sound that is. I have no background in Phonetics. I am supposed to take this class this semester, but then my TA class is in conflict, so I would have to wait till next year. I am looking forward to it though, because unlike in my former university in the Philippines, there are plenty of speakers of different languages from all over the world here, thus, gathering the data could be pretty exciting. Well, even though I am looking forward to next year when I take Phonetics, I am not a sound person. Linguistics has this continuum of subfields. The field is broken down into: 1) Phonetics: the study of human speech sounds regardless of language; 2) Phonology: the study of the sound system of individual languages; 3) Morphology: the study of the word system of individual languages; 4) Syntax: the study of sentence formation; 5) Semantics: the study of meaning; and 6) Pragmatics: the study of language in its actual setting. Of course, all these can intertwine, thus, you have the interfaces. There are also interfaces with other disciplines, such as Psycholinguistics, Sociolinguistics, Historical Linguistics, Computational Linguistics, Neurolinguistics, Linguistic Anthropology, and others. My area of interest spans the scope of syntax, semantics, and pragmatics. More specifically, I like studying the areas where all three intersect. Like my second paper for example. My second paper, which is about temporal interpretation in a tenseless language, is perfect for this. It includes syntax, because tense is a syntactic phenomenon; semantics, because it is also about the meaning of time as encoded in language; and pragmatics, because it is a study about the actual use of language and how speakers play with different syntactic mechanisms to manipulate the meaning they intend to convey. Regarding languages, so far I have studied Austronesian languages only, mainly Philippine languages. But I'd love to extend that to other languages as well. I dearly wanted to study the South African languages of Xhosa and Zulu, especially because these are the languages that exhibit the famous click sounds, borrowed from the Khoisan people of the bush. If only I had the resources. Well, enough of daydreaming. I have another paper to write in two weeks. Sorry for not being really visiting for a while, but I have been rather busy. And it sounds like you have been, and are going to be too. I hope you get to take on those things you like, you seem so passionate when talking about it - up to the point of making no more sense to anyone not in the scene, where it not for your taking the time to explain continuously. Good luck on that final Paper! Good luck with your final paper and enjoy the Christmas vacations! austronesian languages. i havent gotten around reading your paper yet.